FUR FIGHTThere's a small but thriving rabbit-farming industry in the North Bay. California's hot on the trail of Hawaii for bragging rights over which state will be the first to enact a ban on fur sales and manufacturing—but there's a potential catch in Sacramento when it comes to rabbits. Assemblywoman Laura Friedman (D, Glendale) sponsored AB 44 this year and calls fur production "completely out of line with our state's values." The sentiment is largely shared by her colleagues, as AB 44 has sailed through two committee votes in Sacramento. 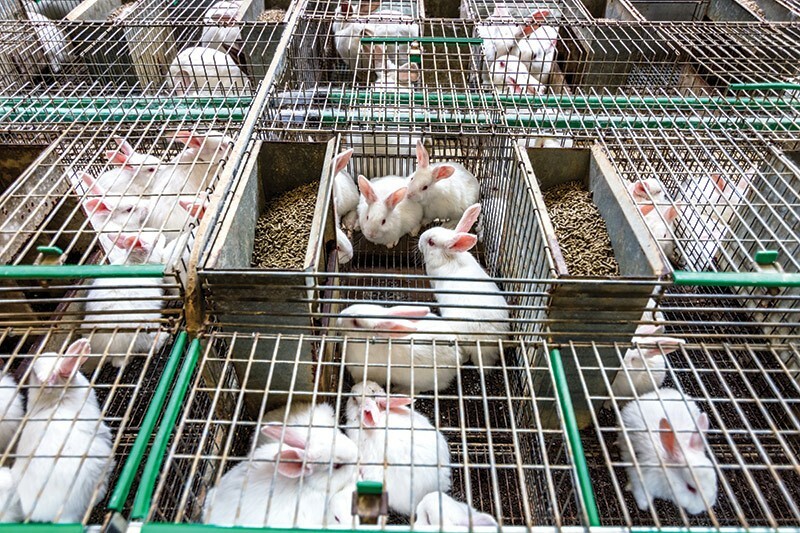 But citing concerns about the impact on Northern California's rabbit farmers, Assemblyman Marc Levine (D, San Rafael) has proposed an amendment that would exclude from the ban rabbits grown for their meat. There's a small but sturdy rabbit farming industry in the North Bay that mostly provides meat to regional restaurants. Animal-rights advocates say Levine's proposal would defeat the purpose of the proposed ban on the sale of fur in California—and offer the state's rabbit industry a monopoly on legal fur production in the state. Friedman says she's talking to the rabbit industry about a way to exempt "animals that are clearly and demonstrably raised as food," but so far, Levine's amendment has not been attached to the bill. "The flipside is that we don't want to encourage killing animals just for their fur because that's wasteful and not sustainable. We are afraid the rabbit exemption would create more of a market to do just that," Friedman said. Levine proposed his amendment at a March 12 meeting of the Water, Parks and Wildlife Committee. Levine spokesperson Terry Schanz notes via email that "Assemblymember Levine supports maintaining the highest ethical standards for the production of legal animal products in California." Schanz says that "AB 44 currently exempts most commercially produced fur and hide products including cowhides, lambskin, sheepskin, or the skin or hide of any lawfully taken game mammal. Including the skin or hide of an animal that is raised for food production in AB 44's exemption is consistent with ethical farming standards, reduces waste and maximizes limited resources." His office also notes that Levine has a 100 percent voting record with PawPAC for his work on animal-rights issues. PawPAC's 2018 voter's guide confirms this, but gives Levine an A- grade because he hasn't written any animal-rights bills. "I support the goal that you are trying to seek," Levine told Friedman during the March 12 hearing. "You have a number of carve-outs about the use of the whole animal. There are a number of [rabbit] farms in Northern California that do use the pelts and I'd like you to incorporate amendments that allow for that use." The proposed bill already has a number of exemptions, including wool, cowhide, and religious uses, but some rabbit advocates say Levine's proposal would gut the broader ban if it exempted rabbit fur. The prohibition on fur would apply to the sale and manufacture of clothing, handbags, shoes, slippers, hats or key-chains that contain fur, according to the text of the bill. While beef is equally if not more popular than leather, rabbit meat is significantly less popular (and valuable) than rabbit-fur products, says Noah Smith, a volunteer with SaveABunny, a Mill Valley nonprofit that focuses on rabbit adoptions. Marcy Schaaf, the executive director at SaveABunny, a rabbit advocacy group. says that if Levine's amendment is included, the fur ban "has the potential to set rabbit advocacy back to the Dark Ages." San Francisco implemented a fur ban in 2018, joining Los Angeles and a couple other cities around the state that have banned fur. The local ordinance in San Francisco doesn't have a carve-out for rabbit fur, even if its high-end restaurant customers have a taste for the meat. While rabbit meat is not generally popular with the general public, the rabbit fur industry has continued to grow across the nation. And as the politics around claims of animal cruelty associated with fur farming or trapping has intensified in recent years, clothing brands such as Versace and Gucci stopped using furs in clothing and accessories. Meanwhile, rabbit fur sales increased by more than 50 percent in the U.S. between 1993 and 2015, according to a report on AB 44 compiled by assembly staff. Locally, there doesn't appear to be much of an appetite for rabbit meat on the supermarket shelf. In September 2015, Whole Foods announced the end of the sale of rabbit meat in its Northern California stores, officially ending a short-lived experiment to test the market. A company employee leaked sales figures to NBC Bay Area showing that Whole Foods was selling one to three rabbits in each store per day. Still, a smaller and largely high-end market is still alive and kicking. Mark Pasternak, owner of Devil's Gulch Ranch, a diversified family farm in West Marin, says he primarily sells rabbit meat to restaurants. He also sold a trio of breeder rabbits to Split Grove Family Farms in Penngrove farms several years ago as they were building their rabbit business. Split Grove now sells rabbit meat to regional restaurants for $8 a pound. Old World Rabbitry in Sebastopol is engaged in similar business. Business is hopping, he says. "I'm almost always sold out," says Pasternak. He supports the intention of Friedman's fur ban to discourage farming animals just for their fur, but says the ban would force him to throw away rabbit pelts or sell them out of state. He'd be affected, he says, but wouldn't go "completely out of business," because of AB44, he says. Pasternak and his wife sell a variety of rabbit products online and at local farmers markets, including rabbit-foot keychains, rabbit fur and rabbit-based cat toys. He dismisses the argument that Levine's proposal would incentivize the production of rabbits for their fur within the state. "You can always do an end run around regulations," Pasternak said. "You can do that in any case. It wouldn't act as an incentive [to raise rabbits for their fur]." The religious exemption in the bill applies to federally recognized Native American tribes and other religious uses of fur. But the bill also singles out key-chains containing fur, which are, in many cases, made from rabbits' feet and are considered a lucky charm. According to Wikipedia, "the rabbit-foot charm in North American culture" stems from its use in West African hoodoo rituals. Friedman's still in discussion with industry representatives as her bill makes its way to the Appropriations Committee later in April. "My biggest concern is that they're going to exempt rabbits to get the bill passed," says Schaaf. "It's either a ban or it's not. I'd rather have no ban than a compromise."